The Blood Bank at Max Healthcare was awarded the 'NABH Accreditation for Blood Bank' on February 6, 2009. The newly formed accreditation standard, measures the organizations compliance against stringent criteria on Blood Safety, Process Compliance, Infection Control and Monitoring. "Getting the 'NABH Accreditation for Blood Banks' is the result of the dedication and hard work put in by the entire team working at the Blood Bank, who have untiringly committed to maintaining the highest quality standards. The award is an endorsement of these practices and an overall commitment of Max Healthcare towards these quality benchmarks, said Dr. Pervez Ahmed. 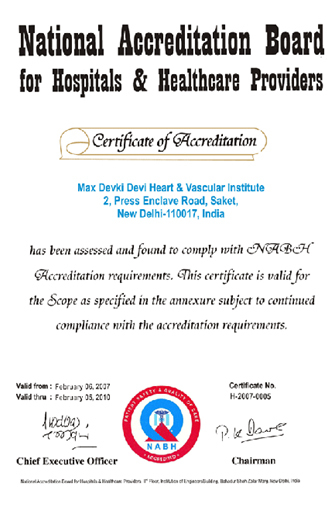 Max Super Speciality Hospital and Max Devki Devi Heart & Vascular Institute at Saket, the two tertiary care hospitals of Max Healthcare, are the first two hospitals of North India to have received the prestigious accreditation from National Accreditation Board for Hospital & Healthcare Providers at the 2nd National Quality Conclave in February, 2007. The accreditation is a recognition of Max Healthcare's commitment to provide the highest quality of care to its patients. The quality of patient care at the hospital is ethical, safe and at par with defined levels. The patient's interests are kept foremost. The patient and his/her family's rights are respected. The system reinforces a culture of continuous improvement. Objective criteria are used to provide evidence of high quality of care. 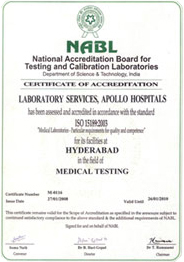 Max Labs 24x7 at MSSH, Saket has been accredited by The National Accreditation Board for Testing and Calibration Laboratories (NABL) with effect from 9th April, 2007 till 8th April, 2009. The first surveillance audit of NABL (ISO 15189: 2007) was carried out on 5th and 6thJuly, 2008 successfully. The value of the ISO 9001:2000 & ISO 14001:2004 certification lies in the fact that it is internationally recognised and is an assurance to the customer/patient that a quality system is in place which the hospital constantly complies with. This certification also ensures that the culture of quality, processes and standardisation spreads within the organisation leading to 'customer satisfaction' through regular assessment and review. Five Hospitals of Max Healthcare are ISO 9001:2000 certified. They are located at MHVI-Saket, Max Balaji - Patparganj, Max Hospitals at Pitampura and NOIDA and Max Med Center - Panchsheel. Max Hospital - Pitampura has also been certified for ISO: 14001:2004. Quality & environment procedures of the Max hospitals comply with international standards. Enhanced technical competence of the hospital staff at all levels in quality & environment issues. Improvement in efficiency and effectiveness of quality and environment measurement programmes. Management receives regular updates about hospital performance with respect to quality & environment parameters.